Each and every week hundreds of new compilations are released into what’s become an increasingly competitive compilation market. Many of the compilers hope that their compilations will be the first in a long-running series. However, only a few of these compilations will return for a second instalment. The rest will be one-offs who are quickly forgotten and destined for the remainder bins. One of then best new compilations of recent weeks comes courtesy of Belgian DJ Lefto whose one the most important taste makers in Europe and is a lover of eclectic and esoteric music. 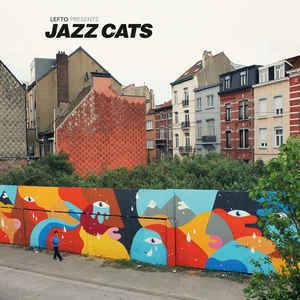 He has been busy recently compiling a new compilation that showcases the best in Belgian jazz Lefto Presents Jazz Cats, which has just been released by the Sdban Ultra Belgium label. Lefto has been one of the most important figures of the Belgian music scene for many years and is has been passionate about the Nu-Jazz scene in Belgium for many years. This makes him perfectly qualified to curate a new collection of Nu-Jazz, Lefto Presents Jazz Cats. It showcases sixteen tracks from a new generation of Belgian jazz artists and musicians. While some of these artists are better known than others, they’re all hugely talented and bring something new to the table. This includes Schntzl who open Lefto Presents Jazz Cafe with the mellow and meandering Lindbergh. It’s a track from Schntzl’s eponymous debut album that was released on W.E.R.F. Psychedelic jazz-fusion collective BRZZVLL’s most recent album was Waiho which was released on Sdban Ultra in 2017. One of the highlights of the album was De Vlijtige Kip which showcases BRZZVLL’s considerable talents. LABtrio released their third and most recent album Nature City on Outnote Records in 2017. It featured Elevator where LABtrio play with freedom and expression. Steiger’s music is often recorded a radical and experimental by critic and their fans. They’ve released a trio of studio albums and recorded a split album with Trafik. However, Part One is a brand new track from sonic adventurers Steiger. Between 2012 and 2017 electro-acoustic piano trio De Beren Gieren have released a quartet of albums, and recorded an album with Portuguese trumpeter Susana Santos Silva. However, Oude Beren was one of the finest moments from De Beren Gieren;s 2017 album Dug Out Skyscrapers. It’s a reminder of how many talented jazz artists and groups there are within Belgium. Commander Spoon’s Introducing-Part III is another track that makes its debut on Lefto Presents Jazz Cats. Although Commander Spoon don’t have the experience that other groups on he compilation have, their genre-melting music is a taste of what’s this talented band have to offer. Strata first appeared on Stuff’s sophomore 2017 album Old Dreams New Planets. It’s a carefully crafted fusion of jazz, electronica and hip hop from this exciting band. Madama Blavatsky’s Steak In The Neck is the third unreleased track on Lefto Presents Jazz Cats. Just like the two previous they’re another talented band with a bright future ahead of them. Outrageous is word that some of BeraadGeslagen’s critics have used to describe them. However, Suikerbeat which features on their 2016 eponymous albums shows that talented is another word that describes BeraadGeslagen. Pudding oO close Lefto Presents Jazz Cats with Hiza Hiza Hey from their 2015 album Lefto Presents Jazz Cats. It’s genre-melting track where electronica, funk, hip hop, jazz and soul that closes the compilation on a high. This week countless new compilations were released into what’s become an increasingly competitive compilation market. Only a few of these compilations will return for a second instalment. The rest will be one-offs who are quickly forgotten and destined for the remainder bins. One of the best compilations of recent weeks is Lefto Presents Jazz Cats which has just been released by the Sdban Ultra Belgium label and is a cut above the competition. ← GRANT GREEN-FUNK IN FRANCE FROM PARIS TO ANTIBES 1969-1970 VINYL.